I would like some information on my Moorcroft Burslem vase. I hope somebody out there knows something about it. I inherited the Moorcroft vase from my late grandmother. 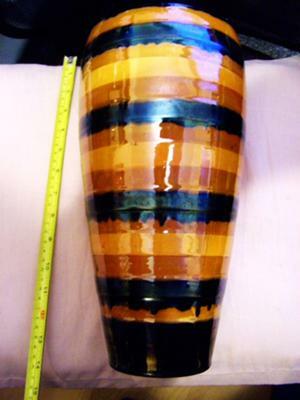 It is 14 inches tall and bulbous in shape, it has brown, darkish red and black circles all around it from top to bottom. It looks like the colours are all running into each other all the way down. It has a very high glaze all over it and is in excellent condition no cracks or chips. On the underneath of the vase it is imprinted with “Moorcroft Burslem England” and what looks like the numbers “101”. I recently asked for advice with regards to the vase on the internet and I sent a photo. I was told that this vase was very Rare and Unique as they had never seen this design in any records for Moorcroft. They could not give me any infomation as to when it was made or by whom. I would really appreciate any help with any information anybody could give me. I would really like to know so i can decide whether to keep it or not. Hi Steve just read your comment regarding my moorcroft vase Thank you so much for the information you have given me. 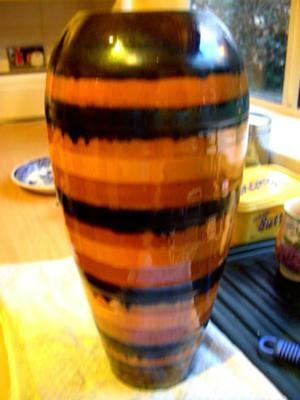 I have however had further informtion from a regular collector of Moorcroft pottery who said that my vase was very UNIQUE and very very RARE and if I decided to sell it he would recommend it would be worth a figure of 600 pounds upwards, what do yo think. Hi Mary, Your vase is a pattern i have not seen before. There would have been many trial pieces that were created for practice by the painter or paintress. The date is 1916-18 and the 101 is the shape code which was impressed underneath until 1926. If you get pleasure from the vase keep it, if not sell it. I just cannot believe that no one can help me with my request for information on my Moorcroft vase. Rregards Mary.